Popular elastomers used to make O-Rings include Viton, Kalrez, Neoprene, silicone, flourosilicone, nitrile, hydrogenated nitrile, polyurethane, ethylene-propylene (EPDM or EPR), silicone, and flourosilicone. Each type of rubber O-Ring has its own specific uses, based on its resistances to chemicals, pressure, and temperature. 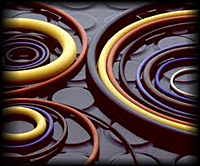 Rubber O-Rings – Arizona Sealing Devices, Inc.
A rubber o-ring is just one of many breeds of o-rings; other sub categories include metal o-rings, flat o-rings, large o-rings and metric o-rings. All of these styles were developed because of a need in the industrial world for seals in certain types of systems and machines. When two pieces of a system or machine need to be joined but still be able to be taken apart again, they need an o-ring to be wedged in between the two pieces during assembly. It then serves as a seal in the weakest part of the machine or system, ensuring that no liquid or gas passing through the two pieces will leak. Parts that can be separated are often arranged that way for maintenance purposes. Machines and piping or tubing systems that use sealants are utilized in many industries, including jewelry manufacturers, water treatment facilities, chemical processing plants, food and beverage companies, oil refineries, and the aerospace and automotive industries. Common applications include rocket boosters, earring backings, brake systems, water pipes and heat exchangers. Two of the most commonly used synthetic rubbers used to make o-rings are nitrile and Viton. Nitrile o-rings are among the most popular types of o-rings, providing good resistance to oils and fuels. Hydrogenated nitrile is similar to regular nitrile, but it adds the added benefit of being ozone resistant. Viton o-rings are very popular as well, mostly due to their resistance to chemicals and high temperatures; however, they may fail at very low temperatures. Teflon is another synthetic rubber often used in the o-ring industry. It is known for its incredible strength and durability. Rubber o-rings can come in many shapes as well as sizes. For example, flat o-rings are usually square shaped to meet the needs of noncircular piping systems and machines. The ridging of an o-ring also varies, depending on the mouths of the pieces that require it as a sealant. There are basic circular o-rings as well as ones with two or four ridges, and others. Rubber O-Rings In general, rubber O-Rings are not made of natural rubber but of a variety of synthetic rubbers also known as elastomers.